The only creature suitable for riding by humans, draengar are bipedal mammals sporting large hind legs and no forelimbs. They have a one-foot long trunk they use to grasp leaves and other vegetation which they bring to their mouth to eat. They have eyes on the sides of their heads, pointed ears, and a long tail with a tuft at the end. Draengar are covered by short brown hair except for a naked head. Riders place a saddle on the back of a draengar and cinch it with straps around the abdomen. The saddle is constructed so that the rider sits with his body parallel to the draengar's body. Elfardim, the feared sentinels of the Shadow Lord, are eight-foot tall, winged killers. Their face looks like a bat sporting a wolflike snout with sharp teeth, a black button nose, and coal black eyes. They are gray-skinned and have large membranous wings. Their chest, abdomen, arms, legs, feet, and hands are human in form. The final digits end not as fingers and toes but as claws. 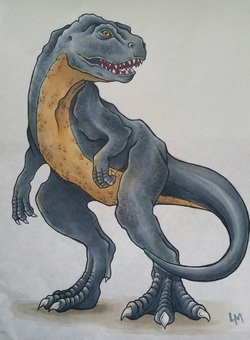 Ghorrim, one of the four races of Altaran, are six-foot tall bipedal lizards that run on enlarged hind legs using a thick, long tail for balance. Their arms are diminutive, a foot in length, and ending with three claws. Their eyes are set in front of a face with a snout resembling a smaller version of a Tyrannosaurus rex. A mouth filled with sharp teeth, small slits for nostrils and small ear holes constitute the rest of their head. The abdominal and thoracic scales are long, tan and horizontal while the rest of the scales are small, interlocking and gray. Ghorrim are adapted to life in a desert environment. Their bodies conserve water and their metabolism is slow, enabling them to eat only occasionally and to require little water. They obtain most of their moisture from their food. They live in small close-knit clans numbering around twenty, ruled by a clan leader who gains his position through fighting. Scourge of the ocean, malcrogs are a threat to the largest ships. The main tubular body of a malcrog can reach sixty feet in length. Eighteen to twenty tentacles thirty feet long extend from one end of the main body, each tentacle capped by a mouth with a circular roll of teeth. The tentacle wraps around the victim holding it for the mouth to feed on the still living victim. The other end of the main body ends in a fleshly arrow point like a squid. Along the sides of the main body are flaps of skin that the creature undulates to move through the water. 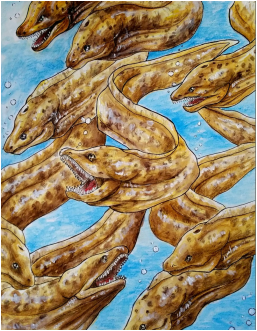 Long, eel-shaped fish with razor sharp teeth, scion hunt in large schools. They are able to strip the body of even a gonyx of all its flesh in five minutes should the creature be so unfortunate as to get caught in the water when a school of scion are passing. They have a specialized swim bladder connected to a hole on their dorsal side that enables them to create a beautiful, melodic sound by using muscles to contract and relax around the swim bladder. Scions have been known to mesmerize humans with their sound so that the humans jump into the water to get closer to the sound, only to become victims.